Discussion in 'Dovetail Live Article Discussion' started by TrainSim-James, Jun 13, 2018. 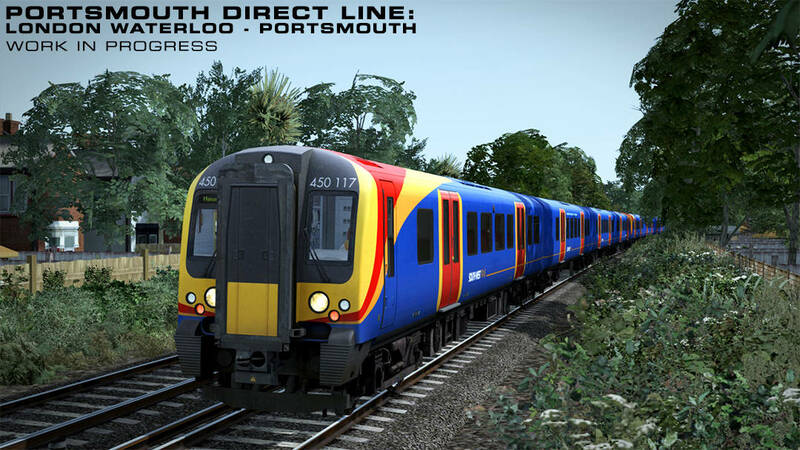 Our re-worked Portsmouth Direct Line, which now heads all the way into London Waterloo, is coming soon to Train Simulator, so today we’re going to take a look at how things are shaping up thus far. As long as we don't have to pay, this will be great, if we do have to pay I really won't be happy. Will the Class 444 be a 'Pro Train' and have a lot of 'Pro Train' features? I would think it would be since Masterkey Simulations are making it but just want to ask. Also nice to see that a fair bit of stock is included. Was worried that it would only end up being the Class 450 and the route feeling empty. I'm not sure if I should direct this at you, but the 450's orange swoop is slightly wrong and the passenger door windows DO NOT extend below the passenger windows. I own Portsmouth Direct and there’s been previous comment that there will be a discount for existing users. On that basis, if it has had significant change and of course extension, then I’m not unhappy about having to find more cash. I suspect like some others I may hold my breath the first time I drive in or our of the ‘new’ Waterloo and watch curiously the indicated prevailing FPS rate, but hopefully it will be fine. What is intriguing, given that Waterloo will now be represented in TS is what other routes that might result in the future. Of course you will have to pay. If an auto manufacturer completely refreshes the design or specifications of a vehicle you purchase, and you wish to purchase the new model, they owe you nothing. Of course you have to pay.. Stunning! If MKS are building the 444, we know it's going to be good. Including the reworked 455/8 was a good idea too. This looks fantastic I can't wait for this to come out! Has permission changed since SWT don't operate trains any more? This is going to be quite a treat. I've never been to this side of the of the world. And to finally have Waterloo was already enough, but to get reworked class 450, 444's as well as 455/8's in SWT livery (377's I'm so well over by now lol)?! Can't wait to get this and run the 450 & 444's from Waterloo. I can't help but to say that I would hope the NEC gets reworked especially with gradients smoothing, better station models, and possibly extended somewhere as well, like the keystone corridor to Harrisburg, or further down towards Washington D.C.. With a little reworking of the AEM-7 too with the much needed addition of the Amfleet Keystone Cab car. I pray to the gods!!! Please tell us that Routemaster is a placeable object! Would like this for TSW please! Ah, I see the tail lights are still on the 450 in the screenshot. Hopefully that'll be fixed soon. Master Key Simulations are responsible for the 444s and 450s so they should be at a quite high visual and functional level. If you have driven the 460 by MKS you can really tell the quality of the stuff made by those guys. Just look at the visual quality of those 450s and 444s! Dirty windows, accurate illumination of the headlights and an amazing exterior model. Prepare to get amazed ! the pictures shown today look very promising. I am looking forward to driving to Waterloo soon. This looks amazing especial the Re-worked stock too by MSK can't really wait for this ones question through is do existing buyers of the PDL get discount? Not i'm really bothered with it would be nice but as a business perspective completely understand your side if you do charge full price bring it on. As said about a bazgillion times, yes, you do. Brilliant! Extra stock included! However I have a few concerns. - Will the 455 have new sounds and not the commonly used recycled sounds from the Thomson model, so that being new recordings? - Also since the entire SWT 455 fleet has Vossloh Kiepe traction now, will that be included? That's all. Looking forward to this! Awesome news!!! Really looking forward to this route... and these trains!! All we need after this is an extension to Weymouth! 1. The numbers be cyan in pictures 3 and 4 of the Class 444! Is it supposed to be like that? 2. Why are both head lights, the tail lights and the marker lights (sometimes) on on all pictures? Thanks for all the questions and the great feedback. Great feedback that I've passed over to the Development Team. We're aware of this one. Naturally this is still heavily in development at the time we're showing it off so there's still things like scripting that is still very much a work in progress. Headlights and other related things will certainly be correctly controllable at the time it gets in your hands. Thanks again for the updates and pictures, it all looks very impressive so far. Time to start thinking of ideas for scenarios. Really excited about this. The stock sounds fab and although I'm a bit hot under the collar about framerates, I can't wait to see Waterloo for the first time. Awesome. This certainly looks like it is going to be the best route of the year so far loads of rolling stock and a fantastic long route to drive them on excellent news for the community. I think DTG might actually do well with this one, looking forward to it. Considering the trains are being remade by Master Key Simulations, will there be a possibility of having passenger announcements in the train? Wow. Nice to see this route getting some much needed love and extension! Also very much looking forward to trying the updated units. I will have to admit to having done this myself a couple of times on scenarios that are just too tight to complete. will AP update their 455 soundpack for the 455/8? That's nothing to do with DTG, ask AP directly. 1. Will the track between Surbiton and Guildford via Effingham be included? 2. Does anyone know roughly when it is going to release? Given that Waterloo is being depicted with its current layout I hope the trackwork around Queenstown Road will also be current, with high-speed crossover between Up Windsor and Windsor Reversible just west of the station. I also hope that the incorrect track layout around P1-3 at Clapham Junction as depicted in South London Lines has been corrected. 1. You've asked when it's going to be released twice. 2. It'll be released when it's released, don't bug developers about release dates. Would be nice to also see the line through Epsom added too!